Hanoi (VNA) – Tan Vu-Lach Huyen Highway in the northern port city of Hai Phong, which includes the country’s longest cross-sea bridge, will be opened to traffic on National Day (September 2), according to the Project Management Board 2 under the Ministry of Transport. 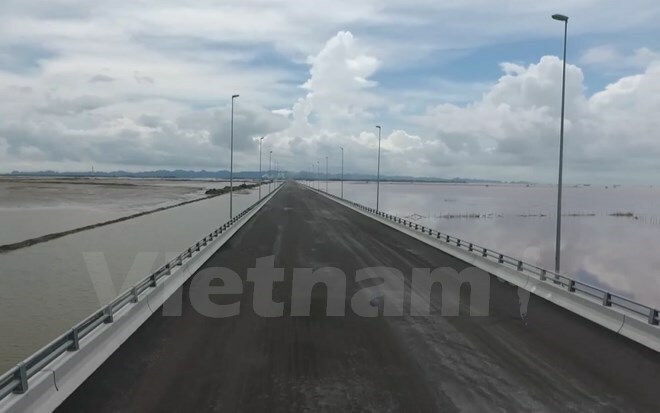 The 5.4 kilometre bridge is part of the Tan Vu-Lach Huyen Highway project which connects developing areas in the east of Hai Phong city with Lach Huyen International Port in the island district of Cat Hai and the Hanoi-Hai Phong Expressway. Once the bridge becomes operational, travelling from Hai Phong city to Cat Hai Island will take about five minutes, compared to hours on ferries. The highway, 15.63 kilometres in length, had total investment of about 11.85 trillion VND (525.3 million USD), with the majority from Japanese official development assistance. The project is expected to form a complete transport network facilitating transportation to Lach Huyen International Port, thereby attracting more investment to Hai Phong city.